Although I had been on a ‘typical’ cruise before there was nothing that could prepare me for the experience of cruising with the Star Clipper. Star Clippers is a smaller cruise liner operating with three tall ships: Royal Clipper, Star Clipper and Star Flyer. They are among the fastest and largest clipper ships ever built. I once had the change to talk to Michael Krafft, the owner of the ships, and he told me he wanted to give his passengers the feeling as if they were sailing their private yacht: to be one with the ocean, the ship, the sails and fellow travelers. “Sailing brings people together”, he stated. When I finally was cruising with Star Clippers myself, I understood what he meant. Star Clipper carries only 170 guests. You’ll never get lost in the crowd, there’s a relaxed atmosphere on board and the other passengers soon become more like friends instead of just fellow-cruisers. You really feel like this is your own private sailing ship, without having to pay a fortune (Star Clipper cruises are very affordable). The ships are smaller so they can stop in ports other cruise chips can’t reach. Think: tropical beaches and small, sleepy islands. You don’t get dropped in a port with thousands of other passengers. On our trip, Jempi and I visited Illes des Saintes and Antigua and we had the whole day to explore the islands just by ourselves, not another passenger in sight. There are no pool games or mister- & miss-cruiseship contest to keep you busy. But trust me, there are far more exciting things to do on board the Star Clipper. Think about climbing the ship’s mast or laying in the bow spirit net out in front of the ship, watching the dolphins playing around. If it’s watersports you love, you’re in for a treat. You can go snorkeling, kayaking, surfing and water skiing every day, all the equipment is available and it’s free of charge. There’s also lots of opportunity to go diving or to go on adventurous excursions. If you want to know more about the ships and life at sea, you can join the captain every evening in the library for some storytelling. The (fantastic!) crew does organize some entertainment after dinner, but it has more a family-playing-games-feeling to it, which is quit charming. I had heard that the food could do with some improvement, but perhaps we had a better chef because the cuisine on our cruise was exquisite. All meals are open seating, the dress code is casual (although during the captain’s evening it’s better if you dress up). Imagine traveling half way around the world. Finally you reach your destination: the Star Clipper, waiting for you in a tropical port. The captain and his crew welcome you like you’re their lost and found again friend, and you feel a bit overwhelmed by being on a grand clipper. It’s already dark when the Star Clipper starts to set sail, and then the music begins: Vangelis soundtrack for ‘Conquest of Paradise, 1492‘. The music, the sound of the sails and the crew working the ship… yes, it may all seem a bit tacky but I saw how some people were so touched by this moment they had tears in their eyes. Of course Star Clippers plays the same music every time the sails are set, but you’ll never get tired of hearing it (although I’m not sure the crew does). Full sails. This is not the Star Clipper but the Royal Clipper. It sailed together with us for two days. If that doesn’t do the trick, I don’t know anymore. Although Star Clippers do allow kids on their ships, there are no special activities to keep them busy. As a result you won’t find many children cruising Star Clippers. We think kids are great fun and adore them, but if you are a couple looking for a ‘private’ holiday, then this is definitely your kind of cruise. Our fellow passengers varied in age from 30 till 70, some of them were traveling alone, others with their spouse or friends. We noticed that many passengers were repeat cruisers and/or sailing fanatics. Meet Mikael Krafft, a Swedish entrepreneur who’s been obsessed with sailing ever since he was a little boy. He was only 6 years old when he worked at a shipyard near Stockholm, and at 12 years he already sailed his 18-foot boat in open seas. When he grew up, he relocated to Belgium in 1986 and became a successful real estate developer. But his love for the open sea and tall ships never faded. At long last Krafft couldn’t ignore his dream any longer and although people thought he had gone crazy, he took a big risk and began building two tall ships, based on original 19th century drawings but adapted to modern times. Krafft made his dream come true: Star Flyer and Star Clipper, two four-masted clippers were launched at a Belgian shipyard in 1991 and 1992. In mid-2000, Krafft launched Royal Clipper, a five-masted clipper inspired by the mythical famed Preussen, a German clipper built in 1902. Royal Clipper is still the largest clipper cruise ship in the world. Michael Krafft has plans for building a forth, even more spectacular ship than Royal Clipper. I’m sure it will be as impressive as the other Star Clippers. Check out this post if you want to read more about our Leeward Island cruise. That looks amazing..I think I’d feel like a pirate (which would be awesome!) Never been on a cruise but this sounds right up my alley! Looking at that second picture… I know which vessel I’d sooner be on… by a country mile! 🙂 Looks like it would be a wonderful experience. Alex and I have done traditionally cruising before and it wasn’t for us but this is something we could totally get on board with! There is something so awesome about sailing and being out on the water! I have never been on a cruise because you know, CRUISE SHIP. But this looks like something I would absolutely love. It looks so open and not at all claustrophobic or overflowing with people. Wow, this sounds exactly like my kind of trip. I am not a cruise lover but would love to be on a sailboat around the Caribbean. Really makes me want to book a trip with Star Clipper! If I would do it I would take your advice and jump on the Star Clipper but as I lived and worked on a small catamaran for 10 months it doesn´t sound that appealing to me anymore. But for everyone who wants to cruise I would say this is the perfect choice. Great article. Wow Nina, I had no idea cruises like this even existed! I am definitely not what I’d call a “cruise person” precisely for the reasons you mentioned, but a smaller ship with less people on board might make me change my mind. Gorgeous photos too! Sounds wonderful! I’ve tried a cruise before with a conventional company and wouldn’t want to repeat the experience, but this looks much better. Although I do wonder how I would cope with sea sickness on a smaller boat! Your photos are beautiful! 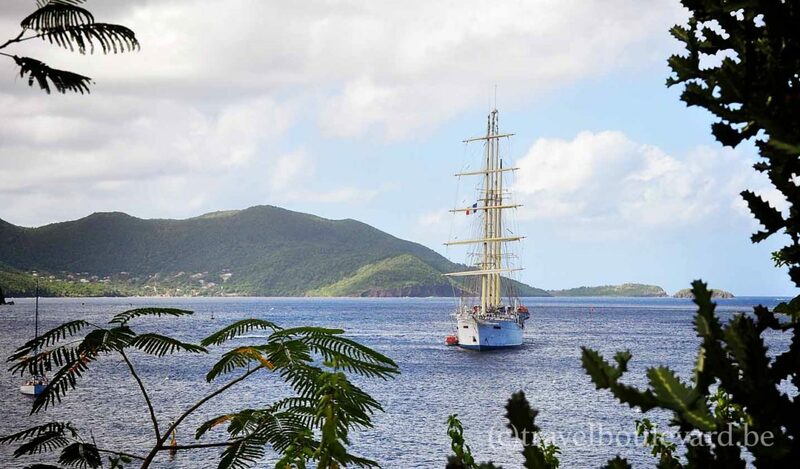 I sailed on the Royal Clipper through the Windward Islands of the Caribbean a few years ago and loved it! My husband and I are now planning to sail on the smaller Star Clipper in mid-August from Mallorca to Menorca, then Corsica, St. Tropez and ending in Monaco. Can’t wait! You know I hate the idea of cruises, but think I could easily cope with this! Brings back memories of when I joined the crew of tall ship Sir Winston Churchill a few years back, sailing around the Canary Islands. Climbing the rigging at night and seeing the silent twinkling lights from the land was just magical. Think I’m old enough for a bit of luxury now though, so maybe Star Clipper next time? It seems absolutely amazing, I wish I could travel on a boat like this once. It feels to be much more freedom than a normal cruise, the pictures are wonderful! Tx Gabor! 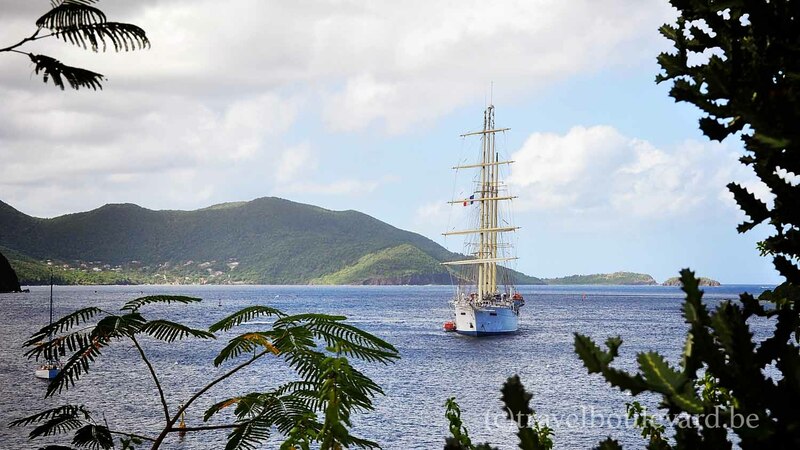 Cruising with Star Clippers is indeed all about freedom, so very different from other cruises. Yes, the Royal Clipper is even more impressive, I hope to sail with it one day. Tx for the visit. I will definitely look into Clippers. Sounds like you had a terrific time. We’ve been on some of the larger cruise ships “Oasis of the Seas”. I worry about getting seasick on the smaller ships. Happy Travels! Hi Carmen! Yes, I was worried too about getting seasick but all went well. I did take some medicine to avoid seasickness with me but I didn’t need them. Happy travels! Fantastic! Would love to try these one day… Great post, guys! Good luck and safe travels! This looks like an amazing trip. We are pretty anti-cruise people, but this looks more up our alley. Less people, more relaxed, better ports, etc. Thanks for sharing this and safe travels! Tx. It is amazing, for all things you’ve mentioned. Your photos are absolutely gorgeous and this looks both so much fun and also so relaxing. Definitely one for my bucket list!! Thank you for sharing! The ships are beautiful! I’ve never been excited about the idea of a cruise, but I would love to go anywhere on one of those. It just seems so old-fashioned and glamorous – and not going to the ports where everything is geared towards massive groups of cruise passengers would make it even better. Yes, it is really a nostalgic trip, and very glamorous and romantic. Wow great post guys! I would LOVE to go on one of these days, the last picture is gorgeous! That must be such a relaxing ride at sea with such great views. Yes, it is really amazing! I will check out the Travel Photo Mondays, tx for the invite! Yes, smaller ships are definitely so much better if you want to go places.